Getting back in the school groove has me ready for fall and all my favorite things that come with it: changing leaves, cooler weather and freshly picked apples! 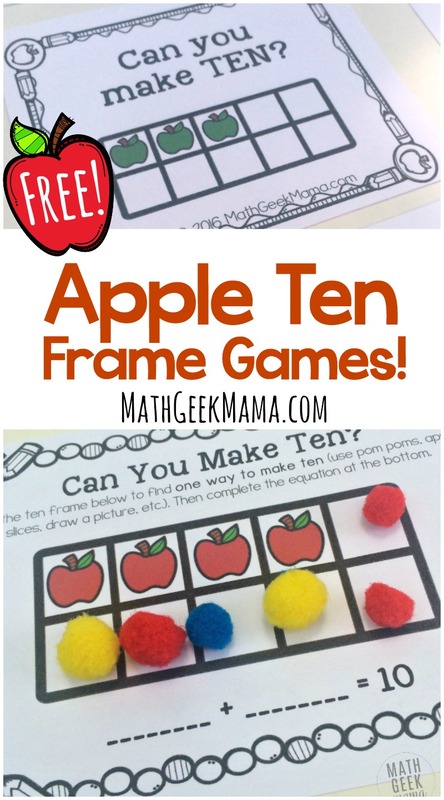 To go along with the apple theme and give my kids some fun new ways to practice making ten, I created some apple ten frame games! 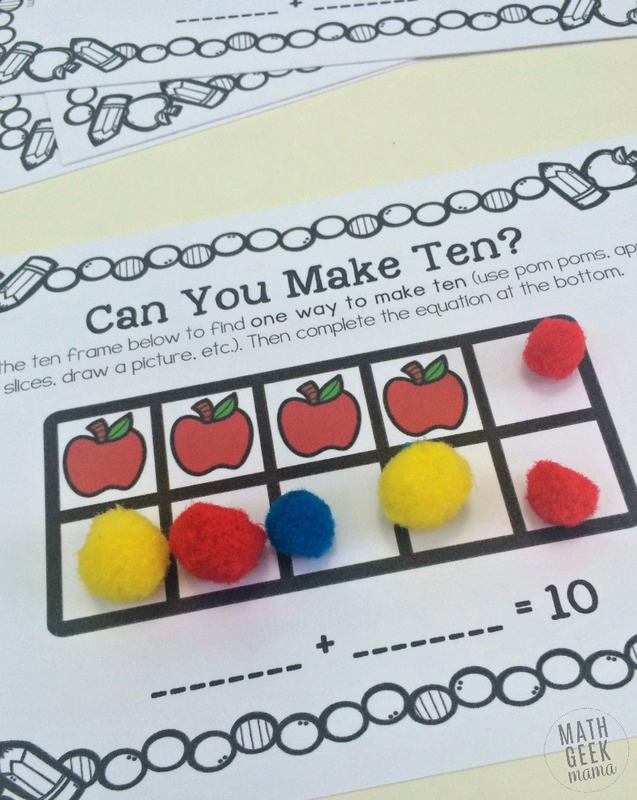 Learning to make ten is an important skill for young kids. 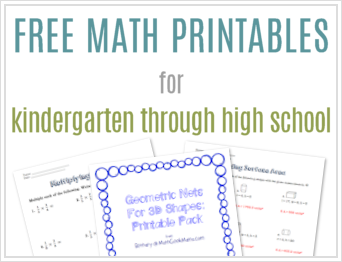 It will help kids develop their number sense and prepare them for more difficult math problems. 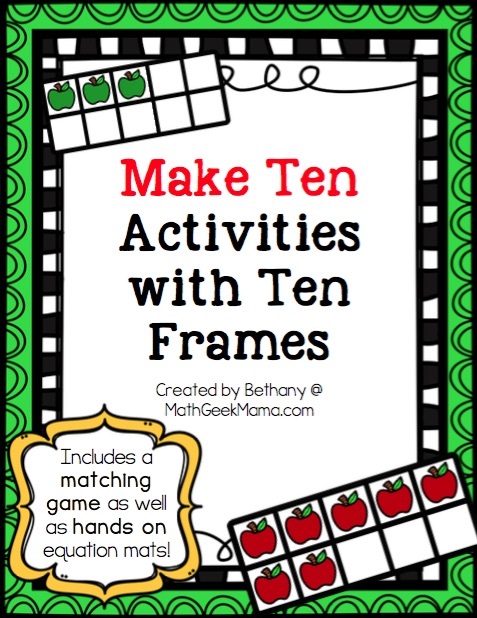 Hopefully this fun set of ten frame games will give your kids some great practice! The first game in this set is a simple matching game. Included are ten frame cards with red apples, and cards with green apples. To play, print out all of the cards on card stock to ensure they are not see through. For extra durability, you may want to laminate as well. Then cut the cards out and you’re ready to play! 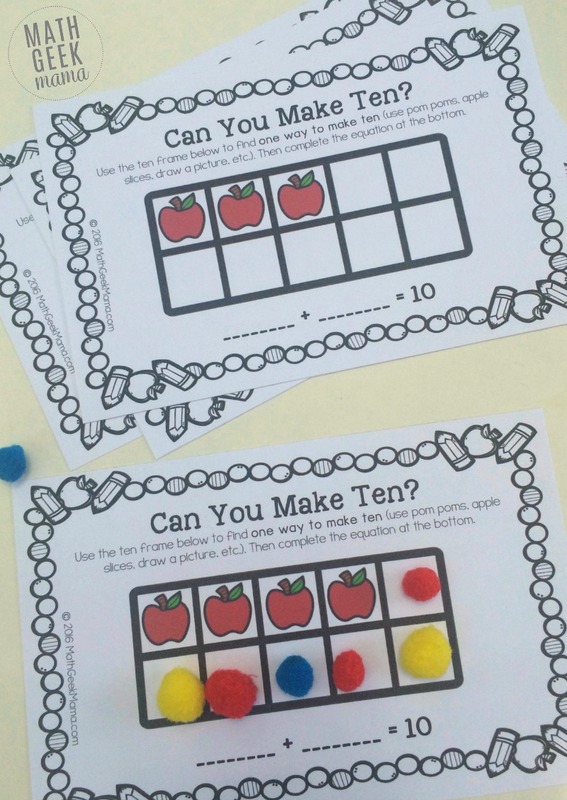 The goal is to match the red apples ten frame to the green apples ten frame to make ten. You can either have all the cards set out and simply let your kids find the matches, or you can set it up like a memory game, with all the cards face down. Then simply take turns flipping two cards to try and find the number bonds of ten. Included in this set are matches from 0-10. Small manipulatives such as pom poms, apple slices, buttons, etc. 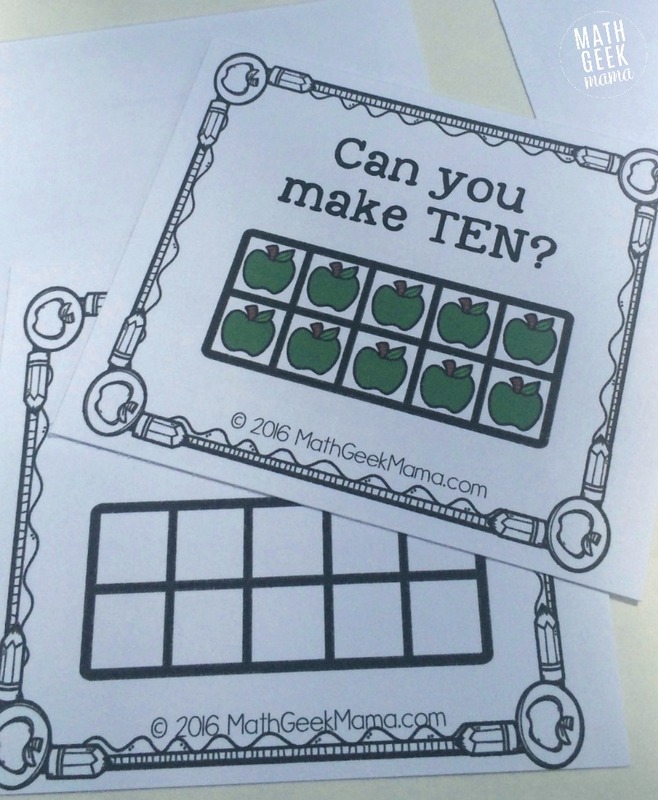 The second activity in this download is a set of hands on equation mats using ten frames. I suggest laminating these mats so that kids can write their equations with a dry erase marker and then erase. This will allow them to be used again and again. The purpose is for kids to complete the ten frame with a small object to see the number bonds of ten. We used pom poms, but using apple seeds would also be fun and great fine motor practice. They then use the ten frame to write an addition equation that is equal to ten. For example, if they have the mat with 4 apples filled in, they would then fill in the rest to show the other “part” is six. They can then write the equation 4 + 6 = 10 at the bottom. 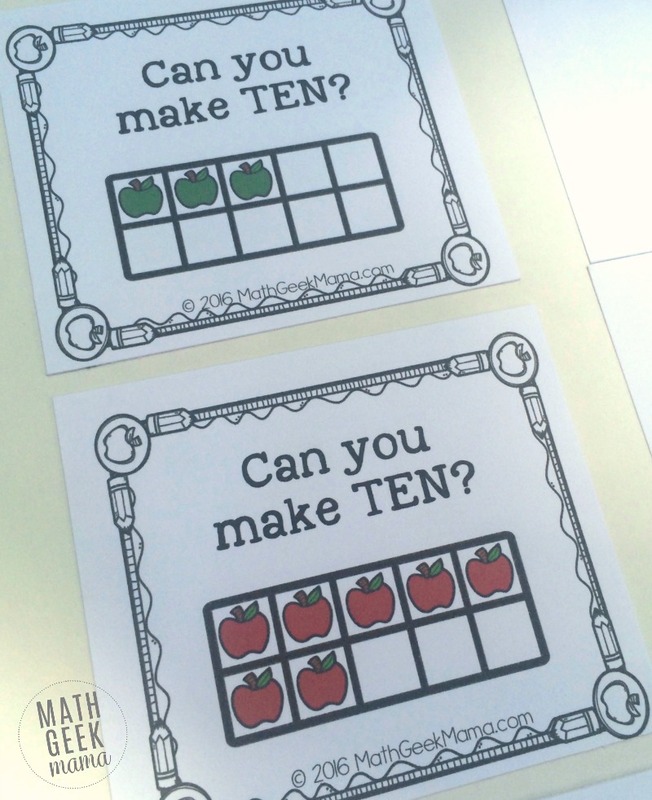 Or using actual apple slices to complete the ten frames would make for a fun fall math snack. 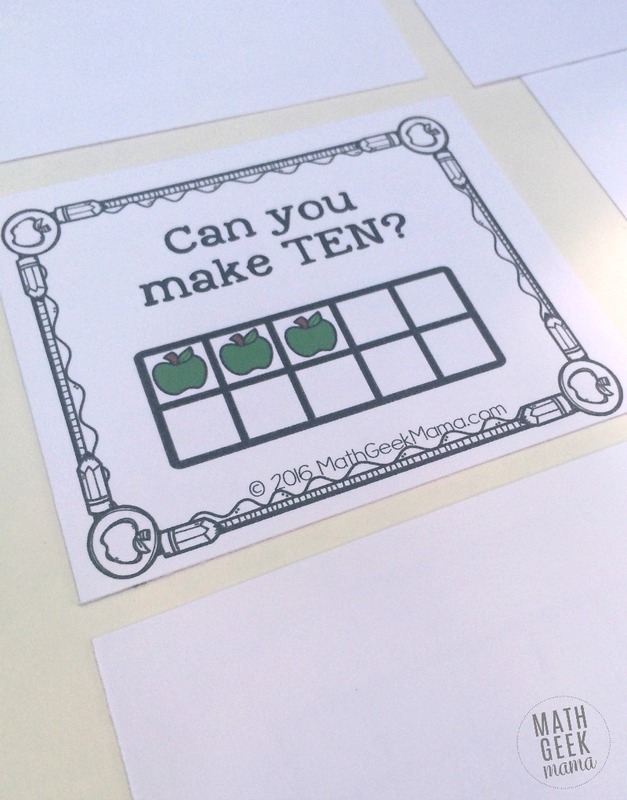 Plus, you could continue your study of number bonds with these apple themed practice pages. And if you love using apples to learn math? 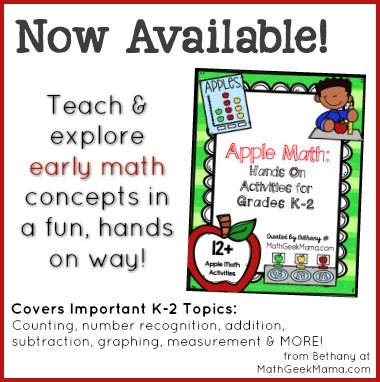 Check out my complete hands on apple math collection for K-2. This resource teaches lots of important math concepts with apples and helpful visuals. Want to grab these fun, apple-themed ten frame games? Just click the link below to get it from my shop! 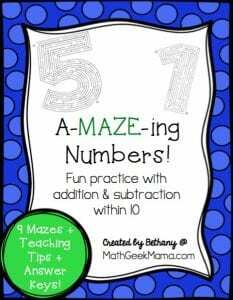 And you may also like this set of mazes–a fun and unique way to practice addition and subtraction within 10! It also includes extension ideas, so kids don’t just focus on memorizing facts, but look for patterns and think deeply about math. 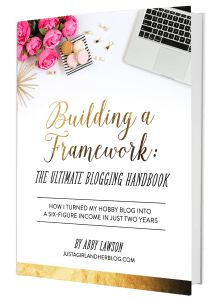 Learn more and get this complete resource here. 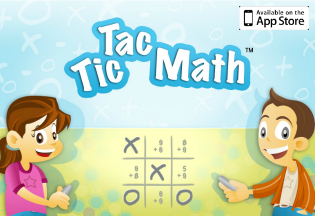 Want more apple themed math fun? Try one of these ideas! 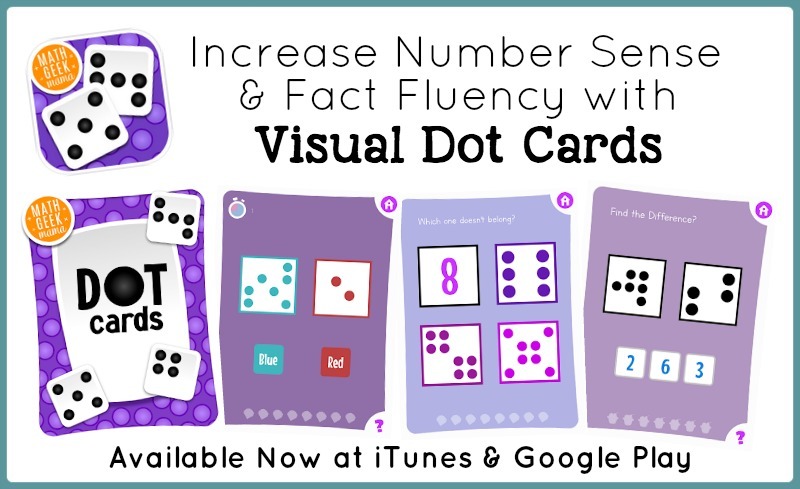 Want more number sense games for your tablet? Grab the dot cards app!